The Dirt - December 2013 - Happy Holidays to all! How in the world did the year-end festivities arrive so quickly? 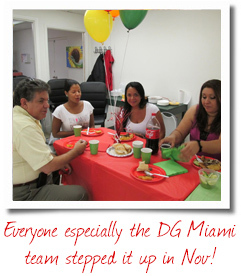 Last Friday the DG Team gathered for our annual Holiday Festivities. 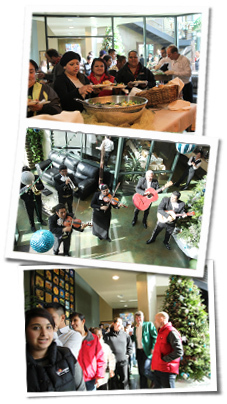 The Mariachis stole the show this year. As I took the time to prepare my annual words of thanks and warm wishes – including a look at where we’ve been, where we’re going, and how we get there -- I was struck by how quickly 2013 came and went. The party was well-deserved and, as you can see from the pictures, great fun! November ended on an extremely positive note for us. After struggling with some weather and uncooperative crops in the early weeks leading up to it, we really rallied at the last minute and closed the books on Thanksgiving with a 99.99 percent order fulfillment rate. We were extremely grateful for that and for the support and patience of our valued clients. Huge kudos to our Dos Gringos Miami Team, which burned the candle at both ends seven days a week to help ensure all orders were filled. Each of these initiatives is key to our continued success, and we’re confident we can make big strides within the next year. 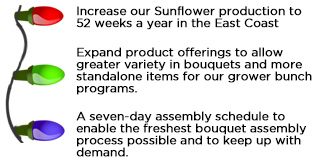 Demand is strong and healthy, and we want to make sure we’re meeting it with the creativity, quality, and quantity expected of us. Our focus on people in 2014 will include enhancements to our Team Member Wellness Program. 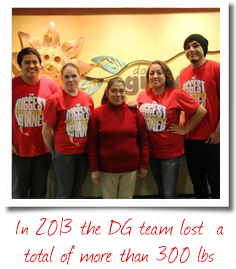 As a Team, we lost more than 300 pounds in 2013, but we know that a healthy body is only half of the equation. A healthy mind and a nice balance of work and play is equally important. Delia Mercado and the Wellness Committee are working on additional programs and offerings for the new year. On that note, I hope this newsletter finds you experiencing a decent balance of holiday happiness and productive, profitable work. I wish you all the best at this most wonderful time of the year, and I hope 2014 holds great success and joy for everyone!